The Incredible Years Parenting program teaches a wide variety of parenting skills and strategies. 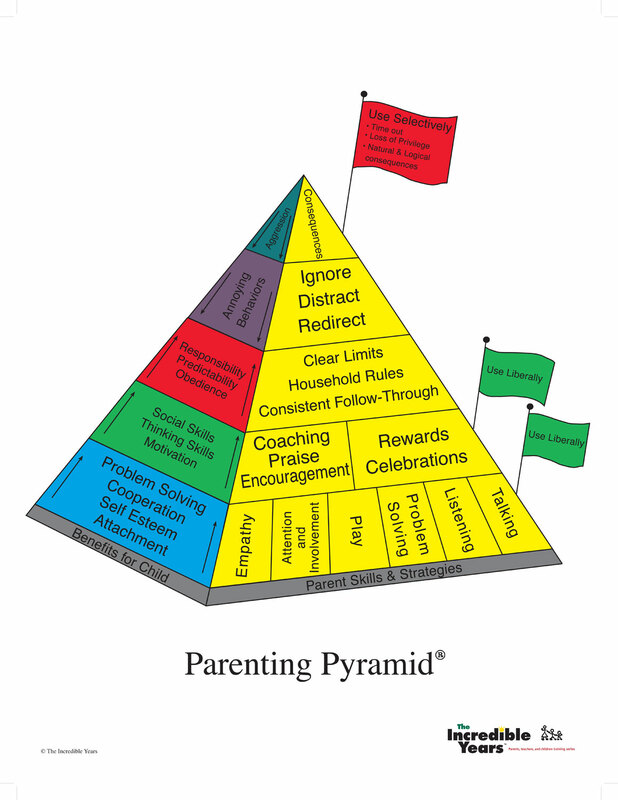 One teaching tool they use is the Parenting Pyramid. I have often taught about a Discipline Flow Chart. I am thinking today about how these compare. They begin with a foundation of positive parenting: liberal use of play, listening, talking, involvement, and empathy. Then they recommend liberal application of coaching, encouragement and praise, and use of the Attention Principle – these all help teach them what behavior you would like to see. This all relates to concepts I’ve discussed when saying all discipline is grounded in a healthy relationship and in step 1 of my flowchart – preventing problems. My step 2 is to pick your battles. They talk about Ignoring Annoying Behavior. My step 3 is to tell your child what TO DO. They use a lot of Coaching. They also talk about establishing routines and rewards which create an environment where it’s easy for the child to be successful, because it is clear what is expected of them. My step 4 is to alert the child to the problem, and let them know that if the problem continues, you will need to escalate up to consequences. They teach the when / then and if / then statements. My step 5 is consequences. They use time out and logical consequences. My step 6 is to Move On. They also talk about the importance of this: at the end of a time out, or after the negative consequence is complete, then you return to positive attention, immediately praising any positive behavior, and moving forward with a clean slate. My thoughts about how these compared is what led me to create my new teaching tool: the Discipline Toolbox. This entry was posted in Parenting Skills on December 8, 2017 by Janelle Durham.